Part 1 offered an overview of the entire paper and what to expect in coming blogs, as well as some brief background on wax coating and typical operating speeds and coating weights. Part 2 will go through improvements that have been made in roll and web handling, closed loop moisture control, and pre- and post-heating and cooling. Part 3 will wrap the series up with an explanation of recent drives and controls, coating application methods and design, and a brief conclusion. 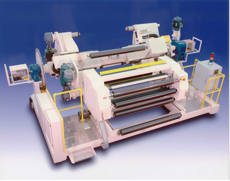 Operation at higher speeds requires more efficient roll handling at the Unwind and Winder ends of the equipment as well as web handling throughout the system. Many of the existing wax coating systems feature single position Unwinds and Winders, requiring that the process line be stopped for roll changes. With the increase in speed comes an increase in frequency of stops due to roll change over. Many of the modern high speed lines are therefore equipped with Unwinds and Winders, such as that shown below, designed to allow for automatic change-over of rolls without the need to stop or slow down the process. The higher speeds also require changes in web handling within the process line. Included in these changes are the use of grooved or crowned idler rolls to aid in web-handling and tracking, automatic guiding to assure that the web tracks down the center of the machine, allowing for a more even distribution of the coating, and precision tension control of the web, which will be discussed in greater detail when addressing the improvements made in drive and control systems. The ability to apply thinner coatings is directly related to the consistency of the product, which in turn is directly related to the consistency of the raw materials that constitute the product. One of the major factors that contribute to this consistency is the moisture level of the paper, which is directly related to the ability to apply or accept the coating. To address this issue, many wax coating operations incorporate equipment to monitor and control the moisture levels of the paper before it is coated. Heating and cooling the web both prior to and after applying wax to paper is an important part of coating process. In the case of “wet” waxing cooling of the paper is critical, particularly after the coating is applied, where rapid cooling helps minimize penetration into the web. Additionally, the paper is often cooled prior to the application to further reduce penetration. In the case of “dry” waxing the web is typically heated prior to coating to aid in the penetration. Additionally, the web can again be heated after the coating application to further enhance penetration before final cooling of the product. Contacting the web with temperature controlled rolls is the most efficient way to heat and cool the web. Increasing the speed means an increase in the size and number of rolls required to heat and cool the web. The size and number of rolls required can be readily calculated. In addition to calculating the proper size and number of rolls required to heat and cool the web, there are several other factors that need to be considered. The location of the heating and cooling rolls with respect to the coating application point is critical. On the entry side it is crucial to keep the rolls close so that the ambient conditions do not affect the work done by the rolls. On the exit side keeping the rolls close to the application point is important to enhance the desired result (rapid cooling for “wet” waxing and additional heat for “dry” waxing). As the coating lay-down becomes thinner, the importance of minimizing the temperature differential across the web grows since the greater the differential the greater the effect on the coating application across the web. The internal design of the heat transfer rolls becomes more important with the use of double-shell, multi-spiral, reduced-pitch rolls recommended to minimize the cross web temperature gradient. It is important that the system used to deliver the heating and cooling fluid is properly sized for the required loads and the roll’s flow rates since an undersized unit (insufficient heating/cooling capacity, undersized flow rate) will result in an increased temperature differential across the roll face. It is also important to remember that changes in heating and cooling requirements should be done by adjusting the temperature of the fluid, not the flow rate since changes in flow rate may again result in an increased cross web temperature differential. Many modern coating lines incorporate devices that automatically control the web’s temperature by measuring it after the heating and cooling rolls and controlling the temperature of the fluid to the roll(s) to maintain a set point.